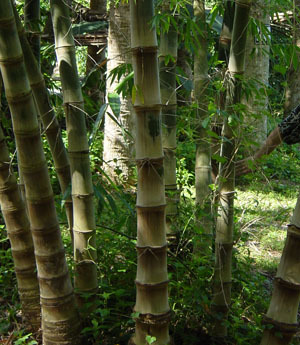 Dendrocalamus asper, common name: Asper Bamboo, is a large impressive timber bamboo that is fast growing in favorable conditions. 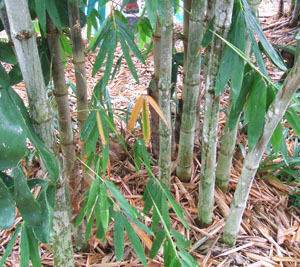 Young culms are covered with a soft light brown fuzzy surface that looks like velvet. Minimum USDA hardiness zone 9A. Prefers full sun. New shoots are edible and said to be very tasty. One shoot can weigh up to 16 Lb. Personal note: mine lost most of its leaves during our long 2009/2010 winter freeze here in zone 9A, but it has since recovered quite well. It's been said that this one tolerates dry conditions better than most, but mine tends to show a need for water quite often in our summer heat by letting its leaves fold. Note: Above and below photos were taken in my zone 9A garden where they are about 3 years old, but the top photo was taken in zone 9B and it's a bit more established. 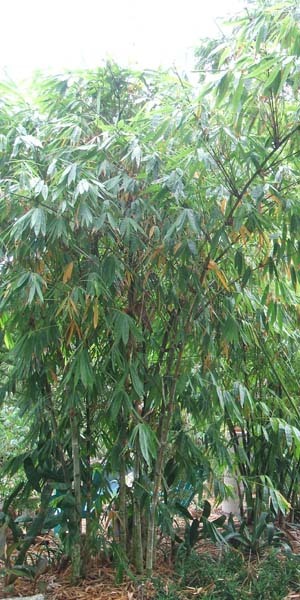 Location and age of plant can make a big difference in the appearance.